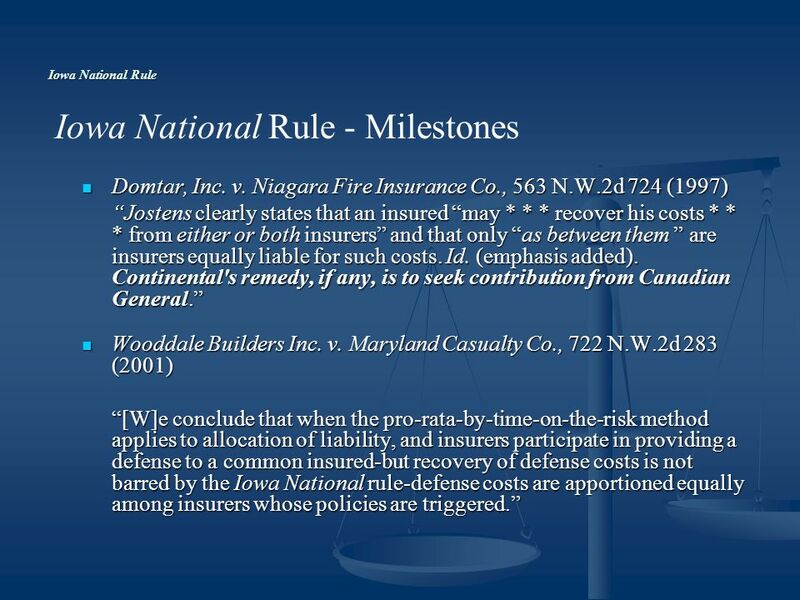 THE IOWA NATIONAL RULE AFTER CARGILL V. ACE AMERICAN ET AL G. John Veith, Esq. Brown & Carlson, P.A. Twin Cities Claims Association Luncheon Seminar September. 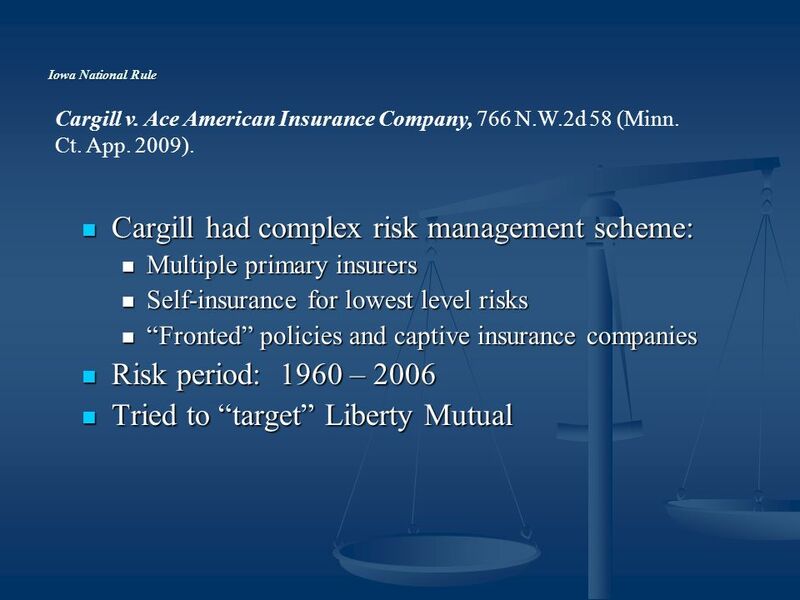 6 Iowa National Rule Cargill had complex risk management scheme: Cargill had complex risk management scheme: Multiple primary insurers Multiple primary insurers Self-insurance for lowest level risks Self-insurance for lowest level risks Fronted policies and captive insurance companies Fronted policies and captive insurance companies Risk period: 1960 – 2006 Risk period: 1960 – 2006 Tried to target Liberty Mutual Tried to target Liberty Mutual Cargill v. Ace American Insurance Company, 766 N.W.2d 58 (Minn. Ct. App. 2009). 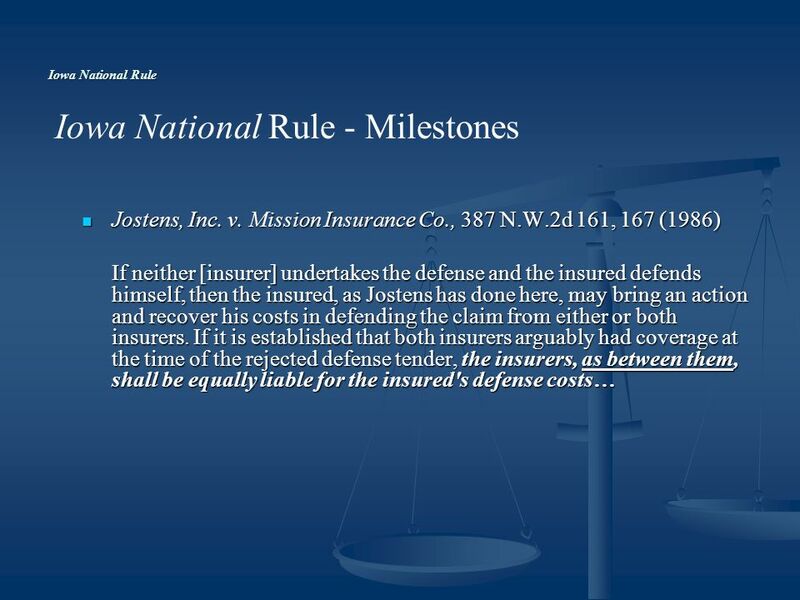 7 Iowa National Rule What the District Court Wanted What the District Court Wanted Equity (despite existence of written contract) Equity (despite existence of written contract) Flexibility is frequently the cornerstone of equity, which should also apply to responsibility for costs of defense. 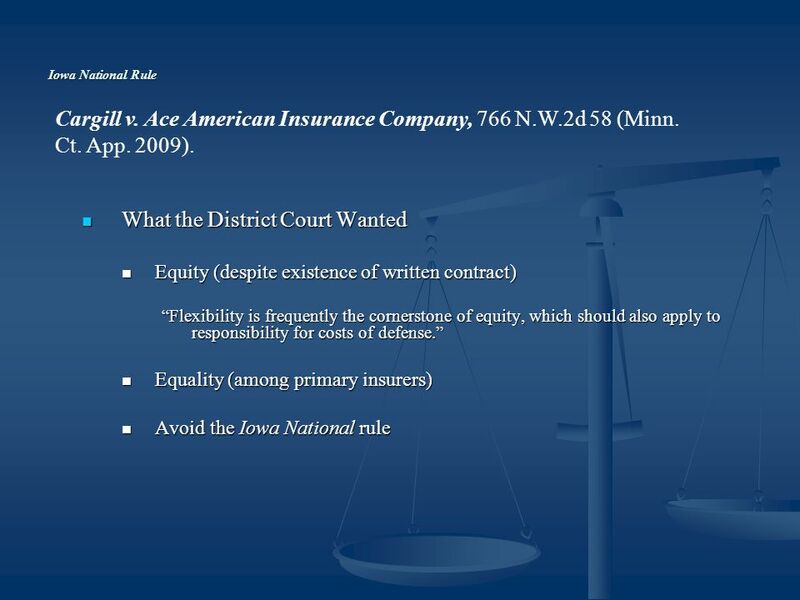 Equality (among primary insurers) Equality (among primary insurers) Avoid the Iowa National rule Avoid the Iowa National rule Cargill v. Ace American Insurance Company, 766 N.W.2d 58 (Minn. Ct. App. 2009). 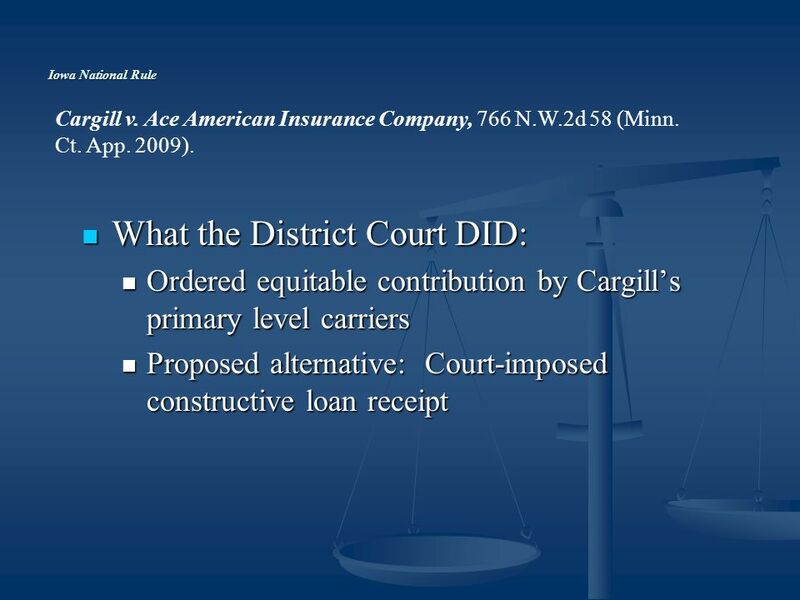 8 Iowa National Rule What the District Court DID: What the District Court DID: Ordered equitable contribution by Cargills primary level carriers Ordered equitable contribution by Cargills primary level carriers Proposed alternative: Court-imposed constructive loan receipt Proposed alternative: Court-imposed constructive loan receipt Cargill v. Ace American Insurance Company, 766 N.W.2d 58 (Minn. Ct. App. 2009). 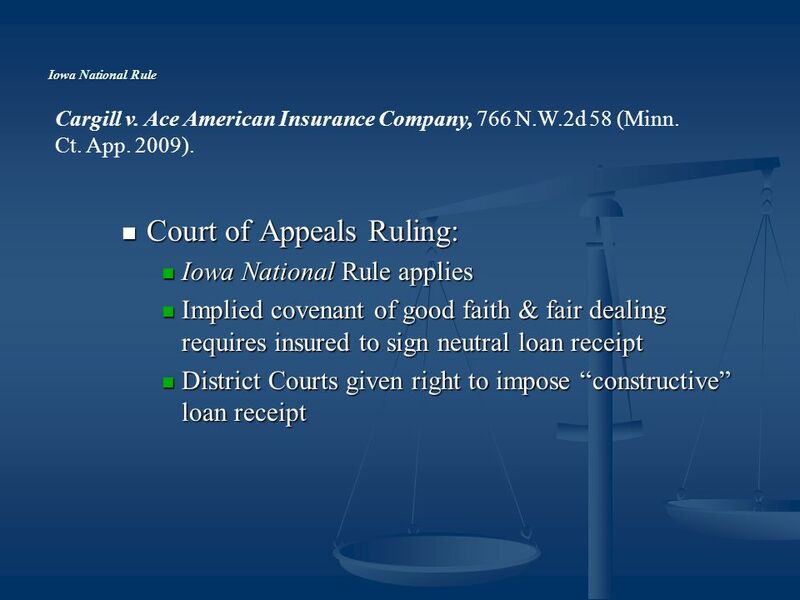 9 Iowa National Rule Court of Appeals Ruling: Court of Appeals Ruling: Iowa National Rule applies Iowa National Rule applies Implied covenant of good faith & fair dealing requires insured to sign neutral loan receipt Implied covenant of good faith & fair dealing requires insured to sign neutral loan receipt District Courts given right to impose constructive loan receipt District Courts given right to impose constructive loan receipt Cargill v. Ace American Insurance Company, 766 N.W.2d 58 (Minn. Ct. App. 2009). 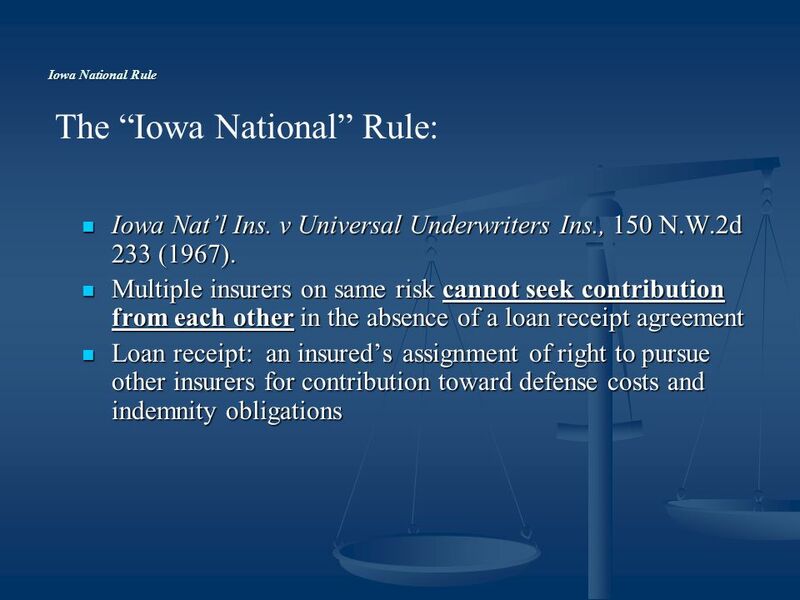 10 Iowa National Rule Effect on Iowa National? Effect on Iowa National? 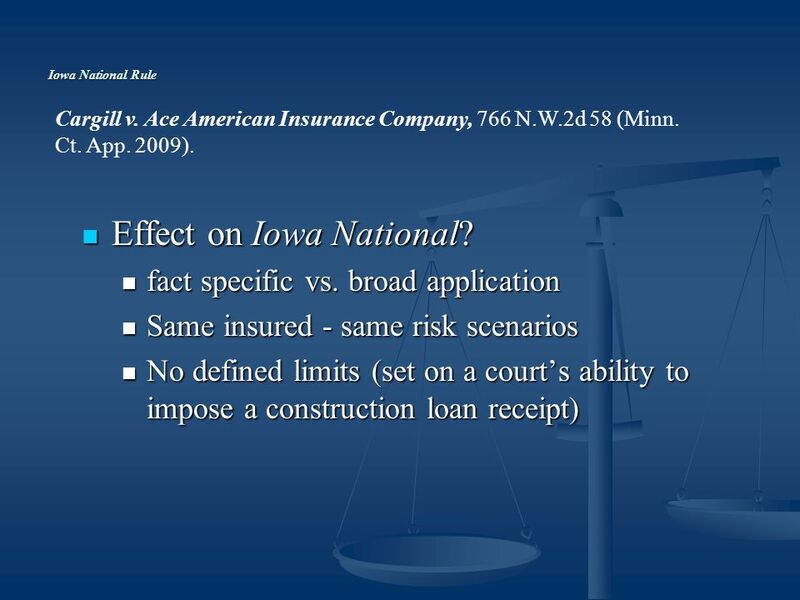 fact specific vs. broad application fact specific vs. broad application Same insured - same risk scenarios Same insured - same risk scenarios No defined limits (set on a courts ability to impose a construction loan receipt) No defined limits (set on a courts ability to impose a construction loan receipt) Cargill v. Ace American Insurance Company, 766 N.W.2d 58 (Minn. Ct. App. 2009). 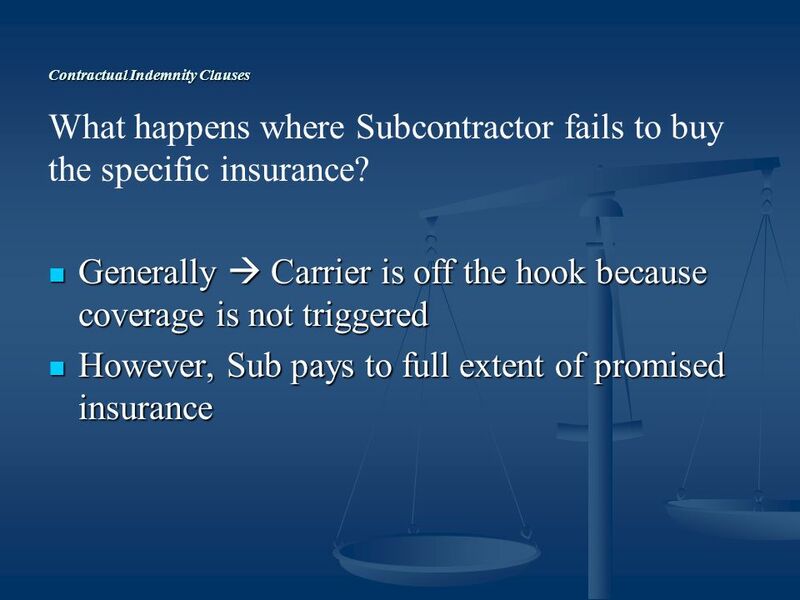 14 Contractual Indemnity Clauses Generally Carrier is off the hook because coverage is not triggered Generally Carrier is off the hook because coverage is not triggered However, Sub pays to full extent of promised insurance However, Sub pays to full extent of promised insurance What happens where Subcontractor fails to buy the specific insurance? 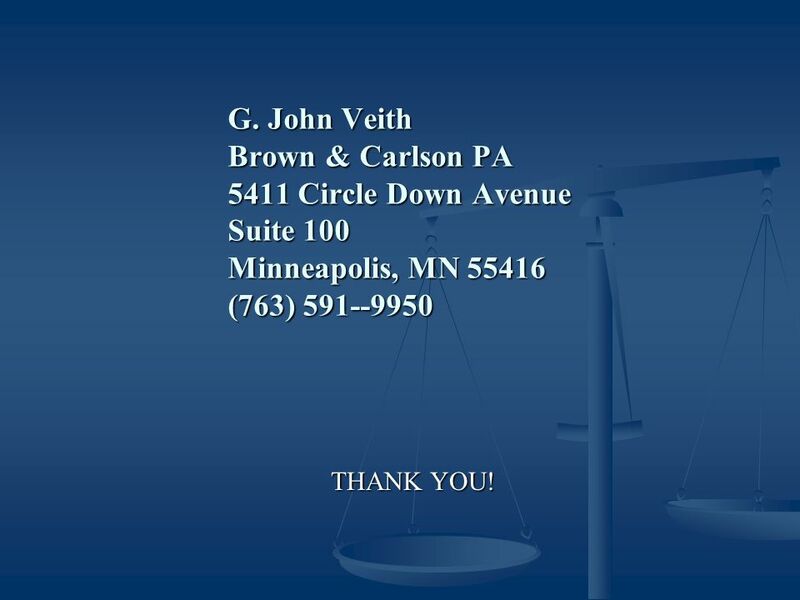 19 G. John Veith Brown & Carlson PA 5411 Circle Down Avenue Suite 100 Minneapolis, MN 55416 (763) 591--9950 THANK YOU! 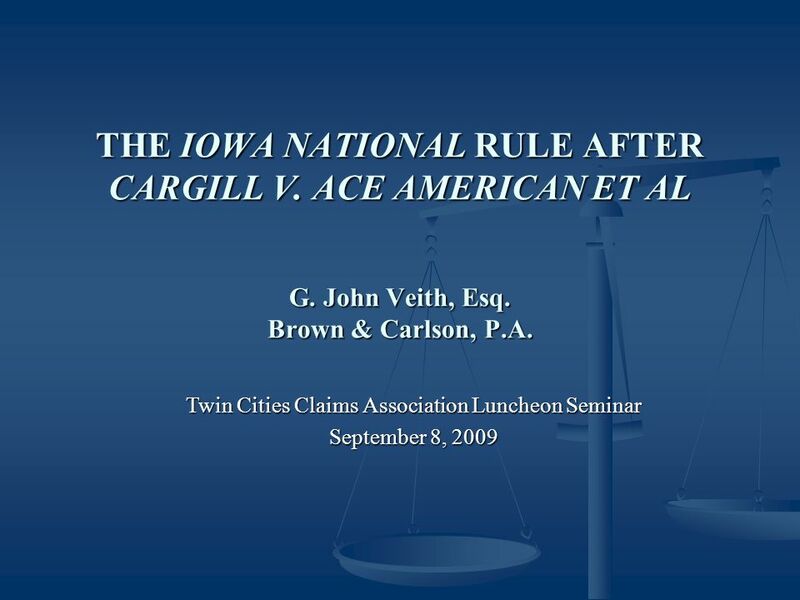 Download ppt "THE IOWA NATIONAL RULE AFTER CARGILL V. ACE AMERICAN ET AL G. John Veith, Esq. 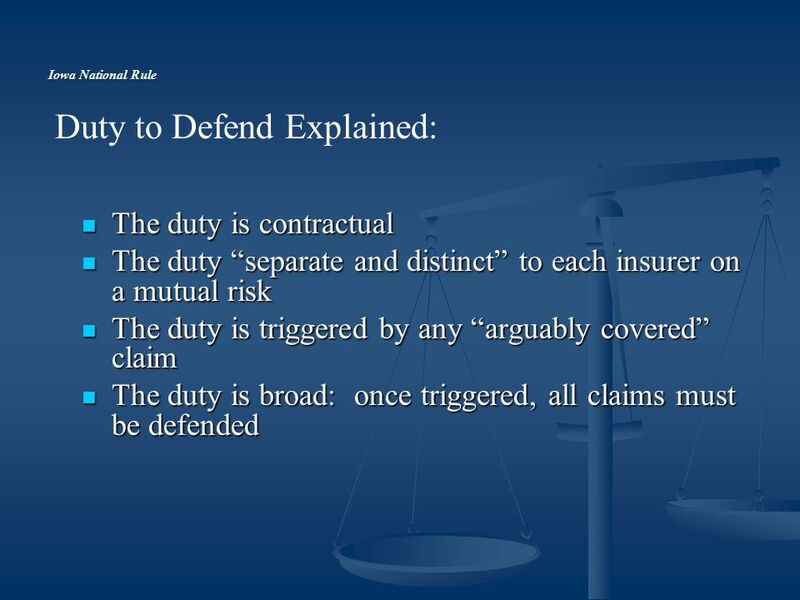 Brown & Carlson, P.A. Twin Cities Claims Association Luncheon Seminar September." 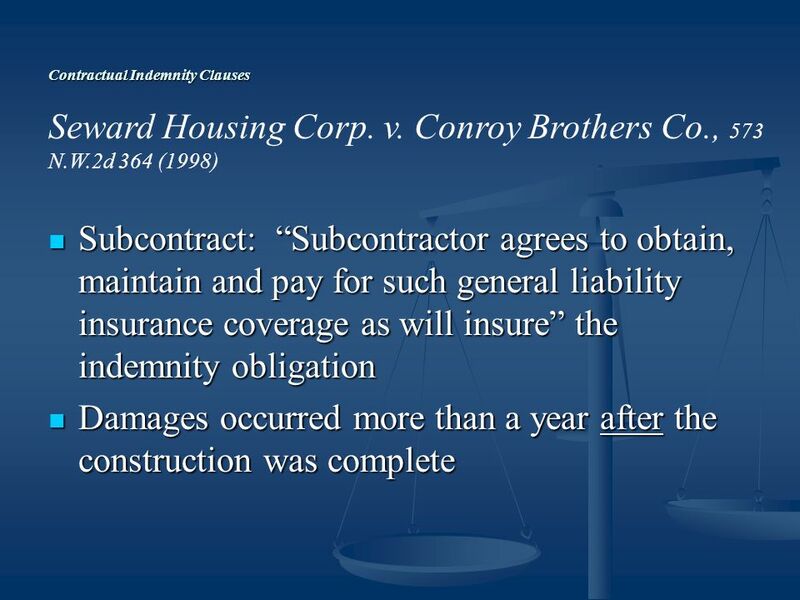 Commercial Insurance: What Every GC Should Know Edwin L. Doernberger, Esq. Jeffrey J. Vita, Esq. Tuesday, October 7, 2008. 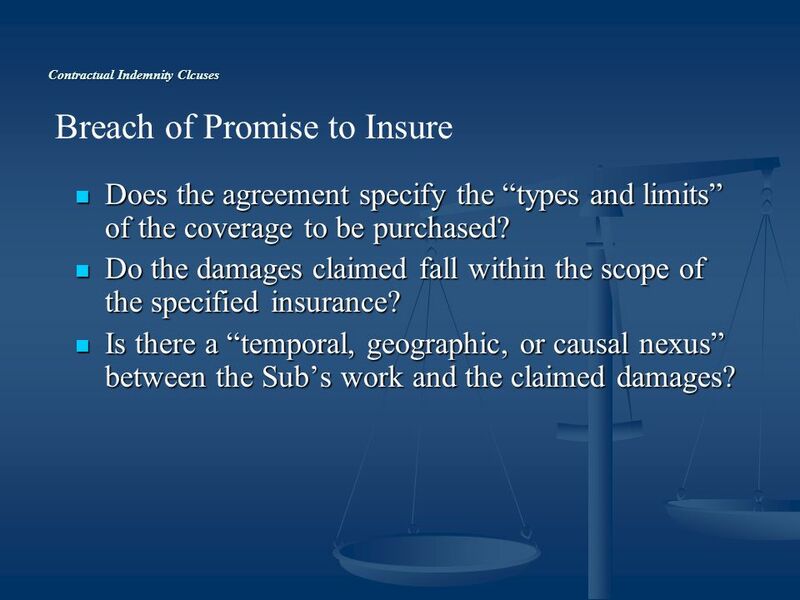 The Insured Rights to recover for sums paid and costs incurred : actual or arguable Liability ? BY DR ADOLFO PAOLINI UNIVERSITY OF BUCKINGHAM, UK AND DACBEACHCROFT. 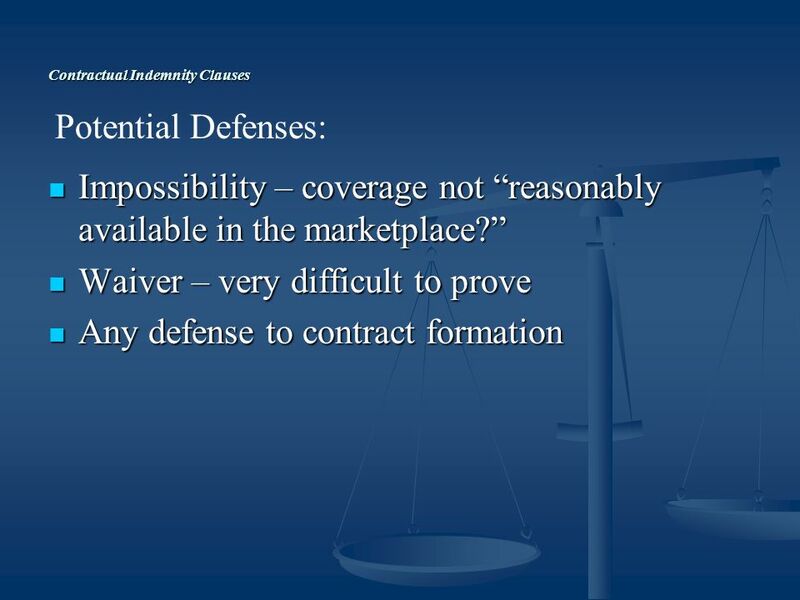 © 2007 Prentice Hall, Business Law, sixth edition, Henry R. Cheeseman Chapter 15: Third-Party Rights and Discharge. © 2010 Pearson Education, Inc., publishing as Prentice-Hall 1 THIRD-PARY RIGHTS AND DISCHARGE © 2010 Pearson Education, Inc., publishing as Prentice-Hall. 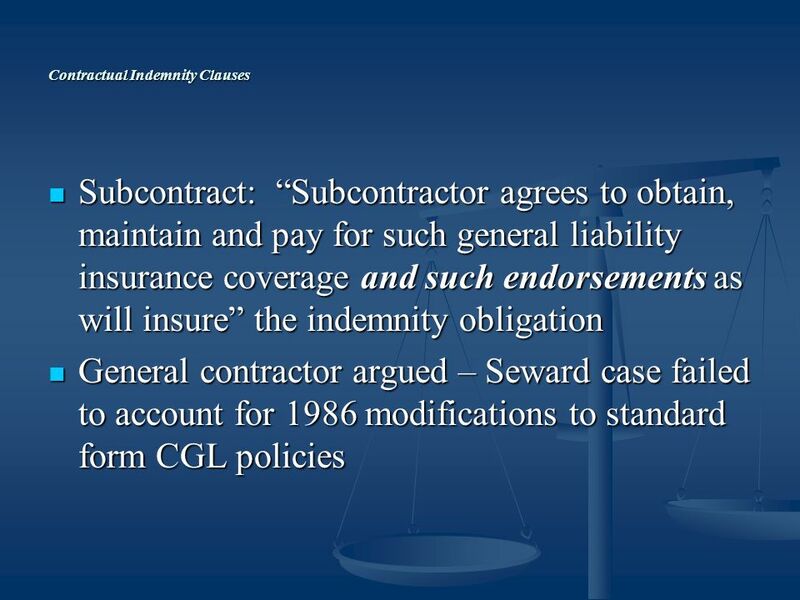 An Overview of the Changing Indemnity Laws and Effective Use of Scaffold Use Agreements to Protect Against Liability. 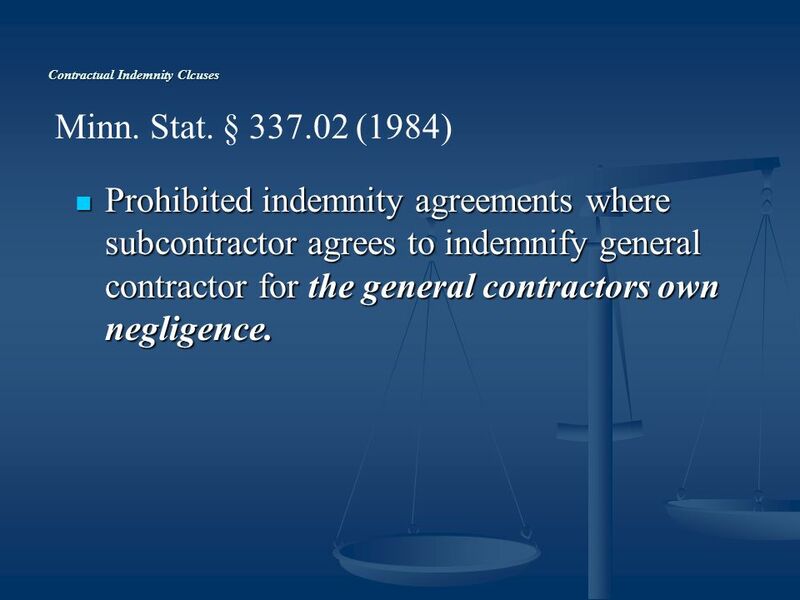 Contractual Liability For Schools… Making Smart Choices and Finding the Negotiator Within Presented by Jessica K. Walls, Esq. Isaac, Brant, Ledman & Teetor. 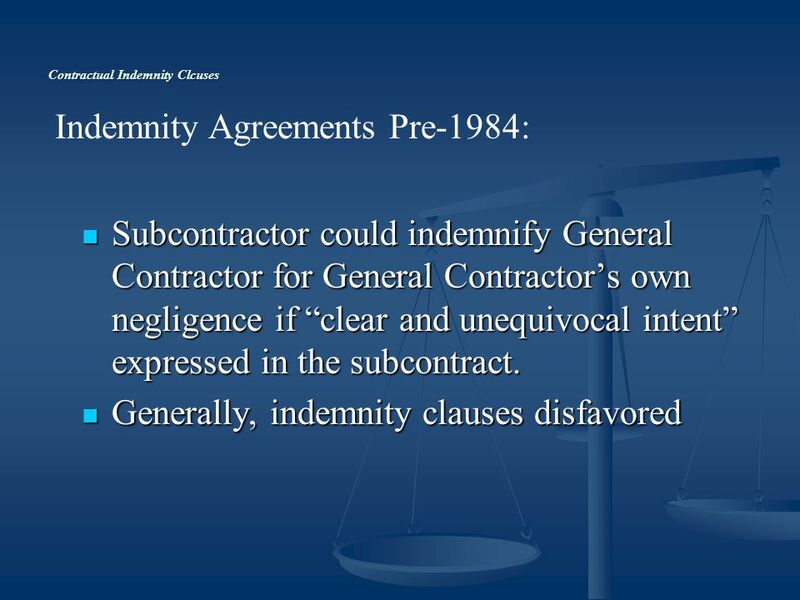 Snow and Ice Maintenance Tenders and Contract Interpretation Robert Kennaley McLauchlin & Associates. 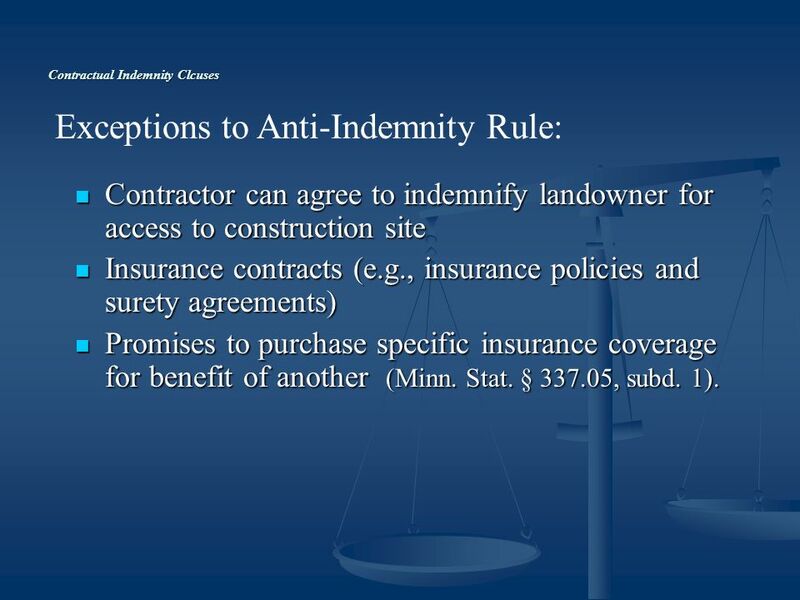 Presented by: David S. Bland LeBlanc Bland, P.L.L.C St. James Pl., Suite 360 Houston, Texas (713) MANAGING RISKS THROUGH CONTRACTUAL.